Finned Tubes are extensively used in the process of gas-liquid heat exchange, where the coefficient ratio of the film is above 2. 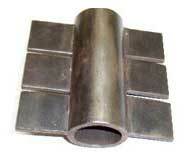 We are counted among the distinguished Fin Tubes Suppliers based in India. Fabricated Finned Tubes offered by us are available in various dimensions to match the various specifications of the clients. High durability, robust construction and excellent performance are some of the salient features of our Steel Finned Tubes.